Dunkin' Donuts Original Medium Roast Blend Coffee by Dunkin' Donuts at Rat Coffee Shop. MPN: NA. Hurry! Limited time offer. Offer valid only while supplies last. 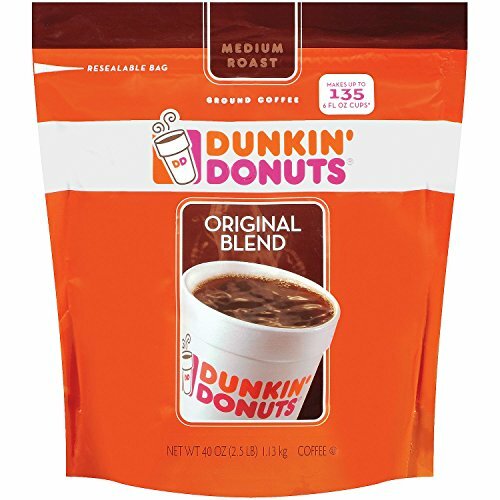 Dunkin' Donuts Original Medium Roast Blend Coffee, 1Pack (40oz Each)IT'S NO WONDER WE'RE AMERICA'S FAVORITE COFFEE. -- Crazy mornings. Commutes. IT'S NO WONDER WE'RE AMERICA'S FAVORITE COFFEE. -- Crazy mornings. Commutes. Life’s daily chaos. That’s where our coffee steps in. One sip and that traffic isn’t so bad, that meeting isn’t so long. So let’s hear it for your daily cup of Dunkin’. -- It’s nice to know that even as the world changes, Dunkin’ coffee remains the same. Always great, always there, when and where you need it to be. Here’s to the greatness of sameness. -- It's a success story that started in 1950 as a single donut shop in Quincy, Massachusetts, and now includes over 6,000 shops. Sure, Dunkin' Donuts is named for its donuts, but it's the coffee that's fueled the phenomenon. And just what kind of brew could create such a stir? Open this bag and find out. By Door County Coffee & Tea Co.
illy Coffee, Espresso Ground, Medium Roast, 100% Arabica Bean Signature Italian Blend, Premium Gourmet Roast Pressurized Fresh 8.8 Ounce Tin, Espresso Machine Preparations.